Posted on Tue, Mar 6, 2012 : 8 a.m. This graphic representation shows what a greenway anchor park could look like at 415 W. Washington St., one of three city-owned properties along the proposed Allen Creek Greenway. On Feb. 2, as many as 1,200 people turned out to hear a presentation at the Michigan Theater about a community development project. This project was not located in Ann Arbor or even anywhere within easy driving distance. The subject of the talk was an innovative urban park in New York City called the “High Line.” Built on top of an abandoned, elevated, Manhattan railway, the High Line is a remarkable success story that has generated tremendous support - over 3 million visitors since it opened in 2009. The level of interest here in Ann Arbor was palpable in the near capacity Michigan Theater audience. Ann Arborites were enthusiastic about this story of reclaiming underutilized space for use as an urban public park. The speaker was Robert Hammond, a founder of the “Friends of the High Line.” Hammond’s group faced opposition to the idea of a park. At the start, business people wanted to tear down the elevated tracks. Rudolph Giuliani even signed a demolition order - one of his last acts as mayor of New York. Yet the proponents of the High Line kept fighting. They persuaded business people and government leaders that the new park space would generate revenue and economic development. Through public/private partnerships they created a beautiful, innovative park that has already produced 10 times the initial projections for visitors and a boost in economic development. The impact can be seen in the 30 new adjacent developments under way - including the Whitney Art Museum. The High Line is expected to generate as much as $500 million annually in additional tax revenues. New York City's High Line project is an urban park built atop an old elevated train tracks running through Manhattan. This ongoing New York success story does have implications for Ann Arbor. We have two ideas for innovative urban parks, The Allen Creek Greenway bordering the western edge of the downtown, and the Library Green - a proposal for a park atop the new underground parking structure adjacent to the downtown library. 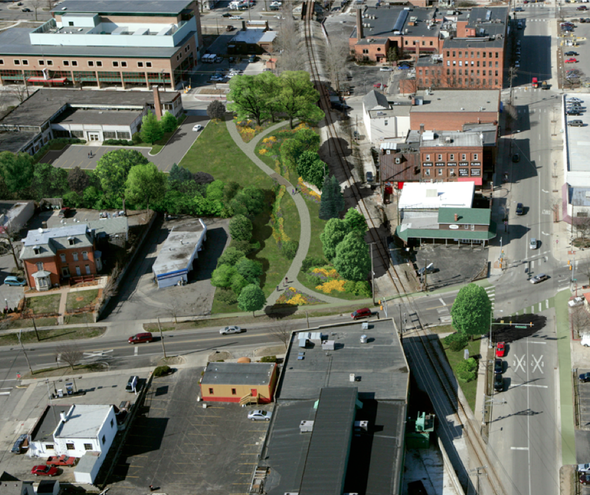 The Greenway proposal has languished while awaiting action by the city. The Library Green is at odds with a pro-density mindset that is currently pushing for maximum construction on five publicly owned, downtown parcels. Some urban park opponents insist that every available downtown building site should have the tallest possible skyscraper. But Ann Arbor doesn’t have to choose between a skyline and a High Line. If we think creatively we can have more density without sacrificing our entire downtown to concrete and steel. In the 1990s, we reclaimed thousands of square feet of unused downtown floor space by updating the code to permit loft space conversions in existing buildings. Now those spaces are home to downtown residents and businesses - within the historic architecture that gives Ann Arbor its character. Another concern raised by opponents is that urban parks present a safety issue. In the case of the High Line, security hasn’t been a problem. Despite its location in New York City, there has been no significant crime on the High Line during its first two years of operation. Rather than surrender to the fear of “The Other,” Ann Arbor could step up and make all of our parks attractive, lively public spaces - including new ones downtown. The key is to have busy - not empty - public spaces. Through imaginative design and diligent programming, we can have vibrant, appealing public spaces in our downtown. In New York it took the exit of Mayor Giuliani in order to move away from an outdated, limited vision of economic development. New political leaders grasped the power of the positive creativity represented by the High Line. We have government leaders who have earlier in their careers demonstrated the capacity for visionary thinking about public green space. We shouldn’t need to use the blunt instrument of an election to get a change in leadership. Our current leaders could elect to open themselves to new ideas. 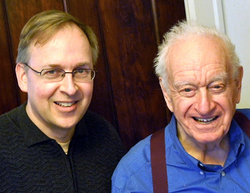 Marc Ross is University of Michigan professor of physics emeritus. Will Hathaway is a member of Advocates for a Library Green. They have each been involved in projects to improve Ann Arbor's downtown such as loft space redevelopment, historic preservation and the creation of the Ann Arbor Hands-on Museum. Yes, capersdaddy, it's too far to walk to Ingall's Mall if you're shopping downtown and want to sit down and enjoy some fresh air and an ice cream cone and watch your kids play in a water feature. it's not too far to walk to Ingall's Mall IF you walk comfortably and want to take a hike from Main Street for a specific event. But there are those among us who don't walk miles anymore but do appreciate green spaces. Thu, Mar 8, 2012 : 3:15 p.m.
As one of the coauthors of the opinion column above, I'd like to respond to some of the comments. I'll address the more substantive criticisms and try to ignore those who are &quot;just joking.&quot; We are blessed with many wonderful parks in Ann Arbor. This does not mean that we don't have unmet public space needs. For example, the advocates for a skate park pointed out the glaring absence of a place for skateboarders and they did a marvelous job of rallying public support to create what will be a major improvement to what is currently an under-utilized corner of a publicly owned site. A major benefit of that park will accrue not just to the skateboarders themselves, but to the people who pause to watch them as they practice their &quot;ollies&quot; and other tricks. This increased pedestrian traffic will generate business for nearby stores and restaurants. If you look at a map of the city, and look closely at the downtown - use the boundaries of the downtown development authority - there is an obvious lack of public green space. If we are serious about attracting people to live and work downtown - let alone welcoming visitors to shop and dine - then we should create inviting urban open spaces. The future appeal of the downtown can't be limited to simply creating more and more parking spaces. Yes, of course Ann Arbor is not Manhattan, the lessons of the High Line project that are transferrable are the creative reuse of an underutilized or abandoned space and the resultant exponential generation of economic benefits. This is what Ann Arbor did in the 1980s when we removed bureaucratic obstacles to redevelopment of abandoned downtown loft spaces. Some critics point to the only existing downtown park, the modest little Liberty Plaza, and claim that its problems - both real and perceived - should remove any additional urban park from consideration. I would argue that we have a chance to fix Liberty Plaza and create a positive synergy with a new park above the Library Lot. Thu, Mar 8, 2012 : 9:23 p.m.
You're right! And I support the Library green! Thu, Mar 8, 2012 : 3:03 p.m.
Reading people say Ann Arbor is not Manhattan epitomizes the problem with a lot of people in our population. Shying away from innovation or trying something new under the guise of not be able to is shameful. People make excuses for themselves to justify why they are not doing something better, that can be done, and instead sufficing with the status quo. I assume this was your thought process when you woke up this morning: I should go to find a way to make the world a better place... but I am not Martin Luther King, so instead I will go on and post blogs and insult someone for coming up with an innovative idea. For the record it is not just that adding this to Ann Arbor is innovative for the city, it is also a model that if more commonly adopted, would serve benefits for the entire world and the environment. Point is, grow up. Ann Arbor might not be New York City, but if that means Ann Arbor can't learn from the projects of cities they are not then it is nowhere near the caliber of city I thought it was this whole time. You should be ashamed of your ignorant narrow minded comments. Will this leave enough money for the council's upcoming moon colonization initiative? This is not Manhattan. How many &quot;PARKS&quot; does AA have now? Does the City even have the money to maintain them all? Get a clue. Wed, Mar 7, 2012 : 1:32 a.m. If I wanted to live in New York, I'd move there. I like living in Ann Arbor. I like the fact that it's not (currently) overrun with skycrapers or high rises, that there are plenty of parks within walking distance of pretty much the entire city and that it's small enough that I see many people I know on a walk through the city, yet large enough to support a vibrant culture. I like my city pretty much the size and shape it is. It's not New York, or Chicago, or Boulder, or wherever. It's Ann Arbor and it has a character all its own. How about we work towards keeping that character alive rather than trying to make it into somewhere else? The Allen Creek flood zone/plain should be converted to park land... but park land dedicated to only trees. A densely wooded forested area. The trees would help act as CO2 sink/sequestering to help the issue of global warming. A densely wooded area also helps keep the local air temperature down. This will decrease the cost of air conditioning for those adjacent citizens. Help save money and also reduce the carbon foot print and again help impact of global warming. I am serious! Oh yes we would also need to keep NAP out of the area to make sure they don't burn down the downtown area (hey even controlled burns release CO2 into global warming). Maybe we should just disband NAP altogether and save us tax payers some money. I am still serious! hmmm - looks like a2 needs a new firetruck. firetruck? high line? firetruck? high line? maybe a naysayer, more so a realist. cheaper options before we jump the shark and make a soggy high line (and to boot, all things in NYC): - dog parks - playgrounds - community gardens, both food and ornamental - street vendors - pedestrian plazas - bike paths on major thoroughfares - trains/mass transportation - roof gardens for allen creek, make a flood plain, and only a flood plain. for the library, do what lincoln center did, make a lawn, if you build it, they will come. a lawn i said, not the high line. <a href="http://www.nytimes.com/2011/04/28/arts/design/for-lincoln-center-the-art-of-lawn-care.html" rel='nofollow'>http://www.nytimes.com/2011/04/28/arts/design/for-lincoln-center-the-art-of-lawn-care.html</a> and really, this conversation is moot - the high line was built in the 1930's - the historic commission of ann arbor would have never allowed what NYC has done. for all those who can't believe all the naysayers, i can't believe this is even a consideration when this money and focus could go to: the humane society, food gatherers, project grow, the a2 schools technology millage i will vote against, another water fountain, the guy holding a sign at h. pkwy and geddes/fuller, etc. if i didn't pay taxes, i really wouldn't care, but my property assessment laughably went up, so i do. I also am fed up with this unfair and unjust way of imposing taxes by real estate value. So much burden on so few.... and to boot my taxes go up when somehow, somebody declares my house is worth more money. people go crazy and make a real estate boom/bubble and my taxes keep rising. Income tax seems like a more fair and just way to tax fairly. Tue, Mar 6, 2012 : 5:47 p.m.
For the life of me, I cannot fathom why people must make mountains out of molehills and find any argument to improve what is now essentially a dead zone that could have multiple practical uses. The costs of developing a floodway and floodplain for residential and occupied commercial are very high. You could do nothing and let it collect trash, brush and become more of a dead zone, or put it to use as public open space and part of an improved flood control plan necessary for the Allen Creek floodway and floodplain. This is one of the &quot;BASICS&quot; that many of the &quot;naysayers&quot; tell us that government should be doing. mixmaster, you make some good arguments and your clearly passionate about the issue. For many of us &quot;naysayers&quot; it comes down to a city strapped for money. I am a resident, I own a house in the city and I pay property taxes. I for one would rather see more fire and more police before more green belts. In the nearly 18 year I have owned my house my taxes have gone up every year but 2 or maybe 3 where I saw modest decreases that were wiped out the next year. In that time my police and fire departments have been slashed, snow plows don't come nearly as often, they don't pick up my leaves, I could go on. I can live without the leaf pickup I can live with reduced snow plowing. I want more police and I want more fire protection. That is more important to me than downtown green belts and public art. Tue, Mar 6, 2012 : 8:22 p.m.
what's wrong with laughing? glad i could help. as someone like yourself who is so concerned with flood plains, it's interesting how little care you put towards all the leaf debris that washed down drains this year when tons of leaves were pulverized by cars and washed into the huron river. yeah, like xmas tree pickup - leaf pick up was once a BASIC residential service. we have a ton of parks in ann arbor, how nice that we reduce services, and build another park, when we cut the budget to manage the ones we have. Tue, Mar 6, 2012 : 8:18 p.m.
as someone who has visited the high line a few times, it is ridiculous to compare or combine with flood plain management. manage the flood plain, scatter some boulders, but in some benches and walkways - ta da - you have a park when it's not flooded. that's fine and dandy, but it in NO way compares with the beauty and revitalizing aspects of the high line. to invest the kind of design and infrastructure that was (and is) being put into the high line would be flushing money down the toilet, literally. Leaf pickup is a basic service? Don't make me laugh. Until the potential flood issues are settled, why would any private developer take on that risk and, as you say, the high cost of floodplain and public land development? Indeed this is what developers WANT the government to do. This is EXACTLY what government should be doing, improve the drainage, connect public land for use by the public and then maybe developers would be interested enough and be abler to actually develop something. Both issues, public land development for urban open green space AND in this case, flood control are inextricably connected. It makes no sense to do one without the other. So let's not improve the floodplain and let the status quo continue. Too bad for those people and businesses along the way. That's their problem. According to you the owner of the public land bears no responsibility. Tue, Mar 6, 2012 : 8:05 p.m. This article is about the possibility of Ann Arbor doing something in a similar spirit of the High Line. Our opportunity is to improve the Allen Creek floodway and use it for open green space eventually connecting the small pieces of public property along the route all the way to the Huron. Tue, Mar 6, 2012 : 8:03 p.m.
&quot;For the life of me, I cannot fathom why people must make mountains out of molehills and find any argument to improve what is now essentially a dead zone that could have multiple practical uses.&quot; I'm here to learn. Give me a few practical uses besides &quot;green belt&quot; The costs of developing a floodway and floodplain for residential and occupied commercial are very high. But its a cost that would be taken on by the private sector if someone was willing. Why would that not be the best first choice? That choice, assuming there are takers adds to the tax rolls and perhaps jobs as well. I consider flood control pretty basic and this has been a problem in the Allen Creek floodplain for a very long time. high line does not equal basics. public open spaces does not equal basics. basics = leaf pick up, repaired roads and bridges, proper snow removal on residential streets, adequate police and fire departments i hear the naysayers saying &quot;give us basics&quot;, then we'll consider pies in the sky. and i don't disagree with flood plain improvements like what's happening along Washtenaw and County Farm Park. if this is a discussion on flood plains, then let's discuss that - a completely different matter than what the high line is. Tue, Mar 6, 2012 : 5:48 p.m.
Tue, Mar 6, 2012 : 4:22 p.m.
Maybe spend this &quot;extra&quot; money on adding more police first....then think about more green space. Tue, Mar 6, 2012 : 4:21 p.m.
Tue, Mar 6, 2012 : 4:49 p.m. But we've also got sizeable non-city parks right outside city limits. Tue, Mar 6, 2012 : 3:59 p.m. The Allen Creek floodplain and floodway is of little use for anything else but a park. As is stands now the publicly owned parcels are not being used for anything. They could be developed not only for downtown green space but as part of a flood control system. Tue, Mar 6, 2012 : 3:44 p.m. This is a great idea. A spot IN DOWNTOWN that's green and welcoming. How many townies usurp bits of the Diag just to get a reprieve from concrete and high rises hugging the sidewalks? Another green spot between State and Main would be refreshing and could be useful for all sorts of planned community activities.......C'mon negative commenters, not every new idea needs to be trashed. 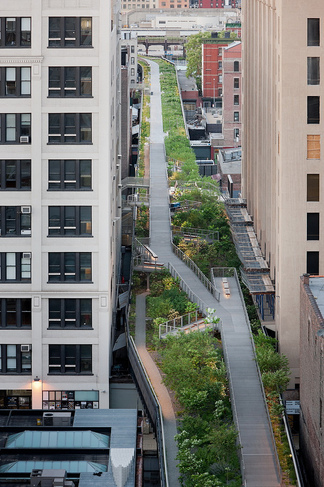 no one disagrees, the idea of the high line is genius. it's the &quot;fit&quot; of the idea with the place that is argued. have you been to the summer festival? a planned, community activity on the ingalls mall? is that too far to walk to from main street? It looks like the top &quot;mock up&quot; has a sidewalk going to the railroad tracks. Seems like a dangerous idea what with those 200 MPH commuter trains and all. And in the bottom picture am I correct that they made a park out of what used to be mass transit? Tue, Mar 6, 2012 : 5:52 p.m. I don't think we are talking about the same walkway in the picture. If you want to insult me at least stay on topic. The walkway in the picture I'm talking about doesn't currently exist. Tue, Mar 6, 2012 : 5:40 p.m.
That walkway connects to the public sidewalk that's been there for decades. Hundreds of pedestrians cross it every day and have for many years. It's only as unsafe as the people using it. If there wasn't a walkway there in the design, walkers would soon make one that cuts the corner. For the life of me, I cannot fathom why people must make mountains out of molehills and find any argument to improve what is now essentially a dead zone that could have multiple practical uses. Tue, Mar 6, 2012 : 4 p.m.
mixmaster, It was supposed to be a joke. In any case the mock up should not include a sidewalk heading to a train track with no crossing point. Tue, Mar 6, 2012 : 3:57 p.m.
Those rail lines were for commercial use The Ann Arbor Railroad a private owner, owns the tracks in the floodplain. The line is limited in length and does not handle passenger traffic. No hi speed rail on that line. may have been mass before they started sinking the tracks below ground, but the high line even passes &quot;through&quot; buildings, akin to subway stops, but i think more for coal delivery and stuff. either way, the tracks had been long dead before reclaimed. The idea is to incorporate something within the city not blocks away... I made my first trip to NYC this year and the High Line ranks up there at the top of what NYC had to offer. The idea is not something expansive but from the current layout of town. It would be an alternative to sidewalks and bldgs. Clearly AA is not NYC and it's not trying to be. This type of thinking would help a great city become better... Isn't that the idea? Note to the authors of this piece -- Ann Arbor has plenty of green space and parks. Unfortunately we are also &quot;blessed&quot; with a mayor and city council dedicated to converting some of our parkland into commercial businesses and parking garages/railroad stations. If you want to have an impact start with the mayor and council. Tue, Mar 6, 2012 : 2:43 p.m.
no thanks, no thanks, no thanks. i love parks, i love plants, i love green - and as others said - A2 has enough parks, and it is obviously NOT NYC. i have absolutely NO confidence this city could do this properly, considering the Percent for Art program and their water sculpture fail. the high line is SO specific, an empty lot or median in no way compares to the history, elevation and perspective provided by the old rail line used for the high line. wanna be NYC? ok - NYC closed off the intersection of 7th and B'way in Times Square. What was once the largest deterrent to seeing a show is now an amazing, open, public square for pedestrians. try that first, maybe Main street. or just study the work of Piet Oudolf, the landscape architect for the high line and millenium park in chicago. try his philosophy with plantings in our existing parks and green spaces. sorry to be so pessimistic, but this city should go back to doing what it does well (i.e. legislating on idling cars, obsessing on crosswalks, on-again-off-again train stations, etc.). at the very least, put this money and effort into improving bike transportation and mass transportation. the magic of the high line is that it is outstandingly designed (benches, drinking fountains, sight lines, plantings, art installations, access points), and it is in NYC, hugged by buildings new and old - that make the juxtaposition of the natural and man-made starkly beautiful. ann arbor allows some of the ugliest buildings to be built - how could it do this right? why isn't this discussion about west park? that was re-done, i'm sure it's a gem, a shining jewel of what this city can do with grass, cement and metal trees. again, no thank you - and this coming from a treehugger. basta. Tue, Mar 6, 2012 : 7:11 p.m. Exactly how I feel about this proposed Allen Creek Greenway...and I consider myself a lefty treehugger as well. Inactive urban parks on the fringe/outskirts of downtown don't add much to the appeal of the city for both residents and visitors/tourists alike. Although in a completely different context, just look at Boston RE: big dig parks...they are &quot;just there&quot;...nothing interesting to attract anyone to spend time there. And that is a large city, rather than a mid-sized town like AA, that has more of the urban-natural juxtaposition factor. further thought: Mark's Carts created something beautiful out of nothing, a parking lot. I would trust him with a project of this nature - but never the city. Great, create another vagrant tent city location. Tue, Mar 6, 2012 : 2:30 p.m.
Tue, Mar 6, 2012 : 2:27 p.m.
New York City / Ann Arbor, Green belts, parks, tax dollars, frivolous spending.... I put the over/under on comments at 97. Wed, Mar 7, 2012 : 1:11 a.m. I was born in NYC. I grew up in NYC. I was educated in NYC. I worked 18 years in NYC. I moved here 10 years ago to get away from NYC. Believe me we do not want to emulate NYC. Why don't we also then just install a downtown wide loud speaker system and have it emulate the noise found in NYC. Constant bus noise, constant fire/ambulance sirens, cars and taxis honking 24/hours. Subway rumbling under your feet. Wall Street robber barons. Sure, throw a bunch of money down the money pit on 5th ave, so we can what? Put a park on top of it? Even Mayor Leftie wouldn't propose that. Now we can take more money off the tax rolls. Then, to make up for the shortfall, maybe sell off Huron Hills. Luckily, this will allow us to buy more land developement rights from the good folks in Dexter (who are laughing thier collective behinds off at us.) Interesting plan, thank you for your input. Next. Tue, Mar 6, 2012 : 2:03 p.m.
Great idea....comparing downtown Ann Arbor to midtown Manhattan. Tue, Mar 6, 2012 : 2:11 p.m.
Tue, Mar 6, 2012 : 2:09 p.m.
Tue, Mar 6, 2012 : 1:52 p.m.
Fantastically visionary plan! Let's go!! I don't know whether you guys have noticed this, but we've actually got a lot of parks in Ann Arbor. We aren't short of green space. Fri, Mar 16, 2012 : 2:59 a.m. Since we ARE NOT short on parks downtown, lets count them:1,.... Oh yea, only ONE. If green areas are so unpopular in immediate downtown areas then why is The Diag busy? we aren't New York in so many ways. Its actually NOT HARD to find greenery in our fair (much smaller than New York) city. And how many more unused patches of green do we need downtown? Seriously is there anyplace in town where someone can't find a &quot;green space&quot; within 6 blocks? Never give in to fear of The Others! However, the first crime committed in this park by somebody from OUT OF TOWN is going to get our collective dander up.